Repeated heading of the ball in soccer – is there a link to brain injury? Another day, another article related to concussion and head injury in sport in the New York Times – this time, concerning a possible link between repeated heading of the ball in soccer and brain damage. The article, ‘A new worry for soccer parents – heading the ball’ highlighted some new research recently presented at the Conference of the Radiological Society of North America. Michael Lipton, associate director of the Gruss Magnetic Resonance Research Center at the Albert Einstein College of Medicine and medical director of MRI services at Montefiore Medical Center in New York, together with colleagues used diffusion tensor imaging (DTI) to study the effects of repeated heading of the ball in soccer, and found that players who repeatedly head the ball with a high frequency had brain abnormalities on scanning similar to patients with traumatic brain injury. DTI was used to examine for areas of fractional anisotropy (FA) in the white matter of the subjects, which is thought to have a relation to healthy brain tissue – healthy white matter having a relatively high FA. Dr Lipton and colleagues used DTI on 32 amateur soccer players who had played the sport since childhood, and estimated how often each player headed the ball on an annual basis based on a standardised questionnaire. They then ranked players based on estimated heading frequency. The researchers went on to compare brain images of the players estimated to have executed the most frequent headers with those of the remaining players, and identified areas of the brain where FA values differed significantly in certain ‘regions of interest’ (ROI) in the brain responsible for attention, memory, executive functioning and higher-order visual functions. Critics of the study may wish to point out the possible issues of recall bias, plus possible errors in the estimates of frequency of heading and statistical analysis as weaknesses of the study. For those who wish to read more, there is a great summary of the study on the Radiological Society of North America website. This includes links to video footage of Dr Lipton himself describing the study and related issues, together with the views of a participant in the study. There have been other studies of heading in soccer related to brain injury, but most of these have been subject to methodological flaws making it difficult to draw conclusions. 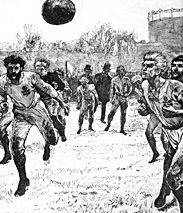 In addition, some studies have included subjects from the days before the modern soccer balls were used, when leather balls could weight considerably more and especially when wet. Zetterberg and colleagues examined biomarkers for neuronal injury collected by lumbar puncture following repeated headings in a training session and found no significant changes in neurofilament light protein, total tau, glial fibrillary acidic protein, and albumin concentrations 7-10 days after the repeated headings, with only a mild elevation of CFS S-100B concentration. They concluded that repeated low-severity head impacts due to heading in soccer are not associated with neurochemical signs of brain injury. Cognitive deficits have been associated with repeated headings in football by some authors such as Tysvaer, although others such as Janda and colleagues who studied a youth population found no abnormalities in cognitive function other than difficulty in learning new words. The debate about heading in soccer and its correlation with brain injury seems set to rage on into the future. In the meantime, what should we tell concerned parents requesting medical advice about the issue? Where do YOU stand on this? CJSM would like to know. 2 Responses to Repeated heading of the ball in soccer – is there a link to brain injury? Being raised in Canada to immigrant Italian parents I have fond memories of watching NHL Hockey Night in Canada as a youngster. Family of ours immigrated from Italy firstly to the Boston, Massachusetts area in the early 1940’s with subsequent family members immigrated to Western Canada in the late 1950’s and early 1960’s. Hockey became an important part of our family’s lives and still is a significant component of our life and more specifically the NHL – our favorite Boston Bruins – and the excitement the game provided and still provides. Watching the local NHL telecast with Dad and my brother was a regular ritual for our Saturday evening frequently followed by attending the local Coliseum to take in the local Senior Men or Junior A teams. The game was a simple one to follow and also was one I enjoyed playing as a youngster. Today, as new father with a sub one year old son I am internally questioning if this game is something our new family wants to participate in. I am sure my family and close friends will wonder what has happened to me and why my apprehension. The aggression that is part of the game is fine to an extent and striving to be competitive, to be the best and win is what drives sports and more importantly sporting enthusiasts like me – but to what level of risk and what are we teaching? And let us not forget is only a GAME. But here is the question posed by me – Vincenzo De Palma: Why is it that now we wonder how to make the game, a sport that involves physical contact, a respectful game that drives to be safer than any other organized sport in the world? We have many NHL Superstars been sidelined with massive head trauma with several of them that will never return. But do we really know how many youth boy and girls are sidelined due to head trauma? Do we even understand when the young children even have head trauma? Please read the following excerpt from a Hockey Canada medical expert in his session at the Ottawa Scotia Bank Place a few months ago. Dr. Mark Aubry was speaking to about 200 parents, trainers and coaches in a conference organized by the Ottawa District Hockey Association at Scotiabank Place on head injuries in hockey. Solving the matter won’t be as simple as designing a new helmet or wearing a mouth guard, he said. Instead, players and coaches will need a culture shift in the way they think about the game. He cited the example of hitting players when they have their heads down as something minor hockey league players and coaches will need to differently. Players used to be encouraged to do this, he said, even if it meant the person would get a concussion as a result. I believe we truly require a shift in our thinking with respect to what is acceptable to the parents and more importantly the North American Minor hockey programs and how about acting on comments from senior level hockey people like Dr. Mark Aubry. I guess I have the luxury of time to experience what the changes if any occur to the game before I make a decision for our son.